Inside we define and describe each of these criteria. For quick 'executive summary' level comparison, a chart is useful. However, our standard report method includes detailed descriptions of each of those 10 points. In the sections below, we describe in detail each category. How many areas a panel can monitor is a core feature. Keeping track of number of sensors is too simplistic and not always helpful. Many sensors can often be connected in series, for example in a bank of windows several sensors may be wired together in a chain and connected to the panel in one circuit. If one contact opens, the entire zone the circuit is connected to alarms with no specific indication of which sensor is reporting trouble. However, granularity can be achieved when zones are associated with one or a small number of sensors in an building's area. In this way, comparing number of zones is a useful metric. Not all panels or systems support wireless sensors. Moreover, some panels may only support wireless with optional equipment or in one specific zone. As with hardwired, comparing wireless zones is the standard attribute. For many systems, the type and ability to have multiple input keypads is a major consideration. While most alarm systems support one installed keypad, the location where it is installed may be inconvenient for quick access by users in all protected areas. Also, the utility of a basic alpha-numeric pad cannot be compared to a full graphic touchscreen that may display or even sound more descriptive messages or be integrated with other systems like video surveillance. Akin to key control or access control, 'user codes' should be assigned to and may be provisioned differently for individual users. Basic alarm systems may support 20 user codes and be more than enough for a typical residential install, but that number may be too limited or small for small commercial use. Likewise, each code may carry different privileges, from a 'master' configured to do anything, to a 'temporary' that may expire after one use that is only valid for a specific range of hours. Not all panels have a web or network interface for notification, control, or programming from a networked device. While this may not be a major dealbreaker for a simple user, the expectation of easy programming, use, and integration often depend on this feature. 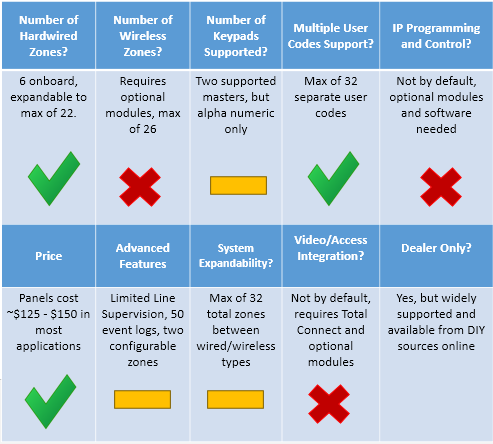 Noting the options and type of IP connectivity is key for modern systems, but many systems lack it or require additional parts to make it happen. This category also indicates the usefulness and/or cost app-based or remote access controls. Key to all IPVM evaluations is pricing, and the ability to compare pricing of one offering to another. In general, if panels are sold by themselves versus bundled with other elements like sensors or service subscriptions, understanding how the pieces compare. For intrusion panels, a 'low' price is on the order of $100 or less for an eight zone system, while a 'high' price common for combo/ or multiple system integrated panels average twice or more that cost for the same number of zones. Comparing additional non essential, but still valuable, attributes of individual systems is key. For example, 'line supervision', or the ability to detect weather sensors on a circuit are tampered with, is not often a major consideration in residential or even small commercial systems, but is often critical in high-security applications. Likewise, noting how many events can be logged into panel memory may make a big difference in some designs but not all. The maximum number of zones a system supports often require additional hardware or modules to achieve that what is available by default on a stock panel. Additionally, the supported number is often different than the individual number of hardwired zones plus wireless zones available from expansion hardware. In other cases, hardware zone expanders may physically support connecting hundred of zones, while the underlying panel only supports a fraction of that number. Noting 'expandability' clears up potential confusion. In terms of tying other systems into the intrusion system, the variation and ability of supported systems is substantial. Some systems support basic access control or video surveillance camera integration by default, while others require additional hardware or software for proprietary devices. Others may not support any integration at all. Understanding the options are important comparison factors. Understanding the availability, support, and pricing structure behind a platform is another key information point. Many alarm products are not available via distribution, and understanding this point often is a factor is weighing buying and support options. In comments below, please offer you thoughts on these 10 criteria. Are they complete? Would other points be more useful? Please let us know.